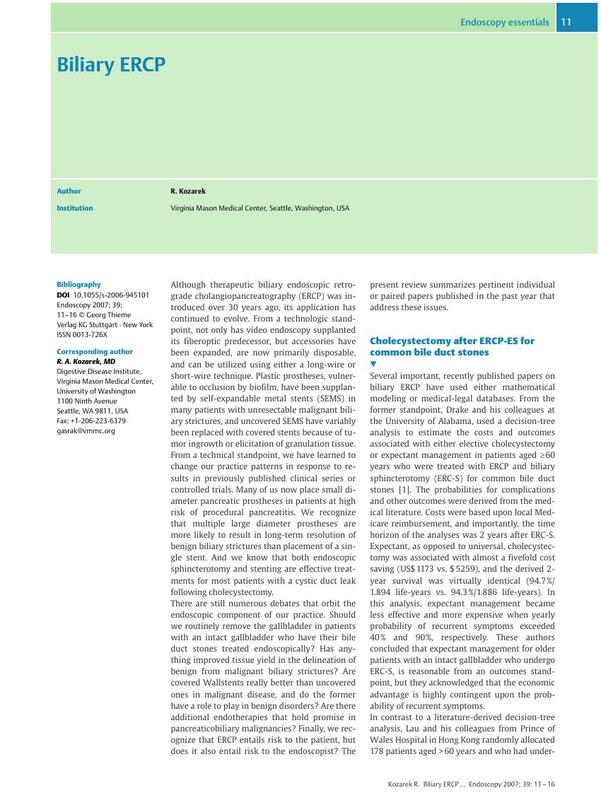 Although therapeutic biliary endoscopic retrograde cholangiopancreatography (ERCP) was introduced over 30 years ago, its application has continued to evolve. From a technologic standpoint, not only has video endoscopy supplanted its fiberoptic predecessor, but accessories have been expanded, are now primarily disposable, and can be utilized using either a long-wire or short-wire technique. Plastic prostheses, vulnerable to occlusion by biofilm, have been supplanted by self-expandable metal stents (SEMS) in many patients with unresectable malignant biliary strictures, and uncovered SEMS have variably been replaced with covered stents because of tumor ingrowth or elicitation of granulation tissue. From a technical standpoint, we have learned to change our practice patterns in response to results in previously published clinical series or controlled trials. Many of us now place small diameter pancreatic prostheses in patients at high risk of procedural pancreatitis. We recognize that multiple large diameter prostheses are more likely to result in long-term resolution of benign biliary strictures than placement of a single stent. And we know that both endoscopic sphincterotomy and stenting are effective treatments for most patients with a cystic duct leak following cholecystectomy. There are still numerous debates that orbit the endoscopic component of our practice. Should we routinely remove the gallbladder in patients with an intact gallbladder who have their bile duct stones treated endoscopically? Has anything improved tissue yield in the delineation of benign from malignant biliary strictures? Are covered Wallstents really better than uncovered ones in malignant disease, and do the former have a role to play in benign disorders? Are there additional endotherapies that hold promise in pancreaticobiliary malignancies? Finally, we recognize that ERCP entails risk to the patient, but does it also entail risk to the endoscopist? The present review summarizes pertinent individual or paired papers published in the past year that address these issues.